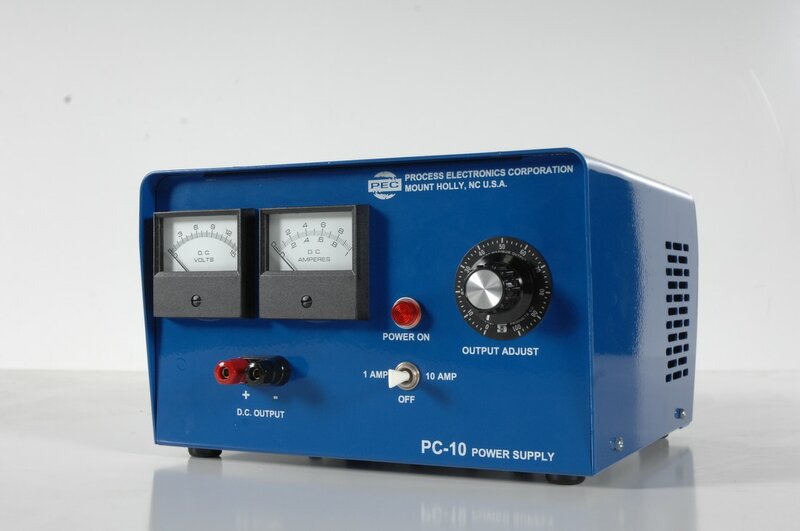 ​The PC-1 0 is an extremely versatile D.C. power conversion system for applications including small plating lines, quality control test, plating, laboratory use, and light-duty battery charging. The unit's compact design (10"W x 8"D x 5"H) and light weight (141bs. )make it an ideal power supply for low amperage standby application. We have incorporated many features common to our larger D.C. power conversion systems into the PC-10 as standard equipment. This includes a stepless, 0 to 100% variable transformer control, an optional dual range ammeter that allows and operator to monitor output form 0 to 1 amperes or from 0 to 10 amperes, and an extended range voltmeter that measures D.C. current from 0 to 15 volts. For maximum efficiency the portable PC-10 incorporates sealed silicon diodes, output ripple maintained at 10% RMS or less, and a quick-change fuse located on the rear panel that protects the unit against overloads. PC-1 0 dual range D.C. power supplies are designed and totally manufactured in-house. All units are tested at full output prior to final inspection and shipping. To ensure prompt delivery, PC-10 power supplies are maintained in stock. All units are also covered by the same comprehensive warranty on major sub-assemblies and components that applies to larger power conversion systems in the Company's product line. For more information on the PC-10, contact Process Electronics Corporation. • 0 to 10 amperes, 0 to 12 volts for application flexibility. • Compact, low profile design for in-plant and laboratory use. • Built-in cord and grounded plug for 115 volt A.C. connection. • Stepless, 0 to 100% variable transformer control for simple operation. • Optional dual-range ammeter reads 0 to 1 amperes or 0 to 10 amperes. • Extended range voltmeter for 0 to 15 volts D.C. monitoring. • Quick-change fuse overload protection on A.C.
• Hermetically sealed silicon diodes for operation reliability. • Exposed metal surfaces treated for corrosion protection. • Comprehensive warranty on major subassemblies and components.